Dirofilaria immitis, an intravascular parasite, is transmitted by mosquitoes and all dogs and cats are at risk of this preventable and fatal disease. The female mosquitoes serve as intermediate hosts after feeding on microfilaria-positive (heartworm) dogs or cats. 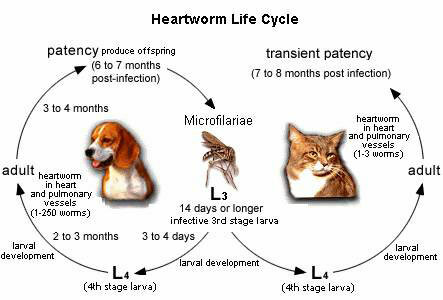 The microfilaria (juvenile heartworms) develop within the mosquito into L3 larvae and can infect another dog or cat within 2 to 3 weeks. A patent infection (microfilaremia) occurs 6 to 7 months after inoculation of the dog or cat by infective (L3) larvae. The clinical manifestation of infestation of this parasite is different for dogs and cats. In dogs, there is a heartworm classification scheme of disease. Heartworm disease in dogs is preventable and treatable with monthly medication administration. There is a wide window of efficacy with up to a 2-month "reachback effect" (elimination of larva that have been in the dog for 2 months). It is extremely important to have your dog tested and placed on heartworm preventatives. If your dog is less than 6 months of age, heartworm testing is not necessary as no patent infection can exist. Many cats will not show clinical signs of heartworm infection. Acute signs include rapid breathing or respiratory distress secondary to pneumonitis or a pulmonary thromboembolism (PTE). Sudden death can also occur. Chronic signs include coughing, respiratory distress, vomiting, anorexia, weight loss, lethargy, exercise intolerance, and right-sided congestive heart failure. There are preventive therapies available that are administered monthly. For cats, there is no treatment. Heartworm infection is typically fatal. 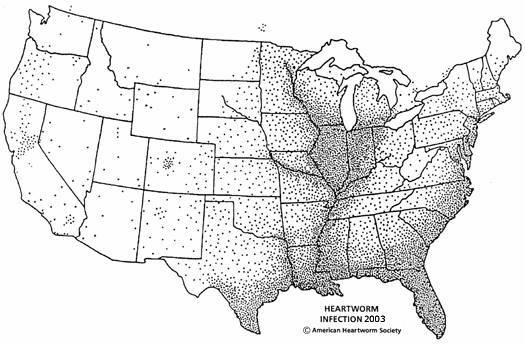 Please visit the American Heartworm Society website for more information on this preventable and fatal disease.